Kitchen Science: What's the Difference Between Brown and White Sugar? We know that, scientifically speaking, brown sugar makes better song lyrics than white sugar, but what is the actual chemical difference between the two? Learn why brown sugar clumps up, how you can unclump it, and what it’s good for. 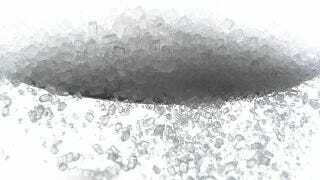 To get sugar from plant form to powder form, you mostly need water. Water naturally dissolves sucrose, even when it’s still in the plant. Of course it will help if you crush up the plant to allow all the sugar in the plant to be immediately exposed to the water. It will also help if you warm the water up a bit, so you can boil it down, (either by turning up the heat or exposing the water to a vacuum) into a syrup, otherwise known as molasses. Cool the entire thing and centrifuge the molasses out and you get sugar crystals. Most likely, they will be brown sugar crystals, because the pure crystals will still be covered with a thin layer of molasses. This layer of molasses will readily dissolve in water, and can be boiled down farther and centrifuged out. It will take a few repeated boiling and trips around the centrifuge, but you will eventually clean off the syrup, and get the naturally white sucrose crystals. Why bother to do all that just to change the color of the crystals? The color is the least important difference. Even the taste isn’t that important. Brown sugar, with its tiny bit of syrup (and therefore water), has only slightly less concentrated sweetness, and 0.23 fewer calories per gram, than white sugar. Have you ever dug that old box of brown sugar out of the back of the pantry only to find that it’s turned into a solidified brick? That’s because the liquid in the light coating of syrup around the sugar crystals has evaporated, leaving the crystals fused together. Brown sugar has more liquid than white sugar. Brown sugar also takes more liquid than white sugar. (You can take advantage of that by putting an apple or some other moisture-containing food in a container with the brown-sugar brick. The sugar will absorb the liquid and soften up the sugar again.) It will also absorb the liquid in your baked goods. This won’t make a difference all the time. Breads, which are baked in pans and have a low sugar-to-flour ratio, will seem pretty much the same no matter what sugar goes into them. On the other hand, cookies made with brown sugar and cookies made with white sugar look totally different. As you can see, the cookie made with all white sugar has spread wide, as though it had a very liquid dough while baking. The cookie made with all brown sugar didn’t spread nearly as much. The hygroscopic brown sugar absorbed the liquid and kept the dough together. So while sweetness and color (and a certain caramelized flavor), distinguish brown sugar from white sugar, the taste of the sugars isn’t the real difference between them. Their real difference is the power they command over water. Image: Umberto Salvagnin, Second Photo by Handle the Heat.